Over the past few years—well, frankly, since the Supreme Court ruled on Roe v. Wade in 1973—we’ve seen a proliferation of evidence that a woman’s right to have an abortion is actively being curtailed by our nation’s representatives. But it’s easy to forget that if you lived before 1973, your lifetime likely spanned just a sliver of an excruciatingly long stretch of time, in which our country transformed from a place where a legal abortion was unimaginable to a place that would legalize abortion in the highest court. While now the anti-choice movement is associated with religious conservatism, the people primarily responsible for making abortion illegal in America the first time were doctors. The first precursors to anti-abortion laws were passed in the mid 1800s as a way to control dangerous drugs sold by quacks for at home use that might terminate a pregnancy but also killed women. From there, as the quacks became less of a threat to the medical profession, doctors sought new and more specific ways to control the same issue—that of medical activities being otherwise commercialized, activities which they thought should be in their court. The antiabortion campaign grew in part, James Mohr has shown, out of regular physicians’ desire to win professional power, control medical practice, and restrict their competitors, particularly Homeopaths and midwives. Laws like the Comstock Law of 1873, which made it illegal to disseminate information about contraception or abortifacients, allowed those in the growing medical establishment—helped by state officials—to criminalize those who were practicing abortion, except in cases where the woman’s life was in danger. Those procedures were called therapeutic abortions. (The eugenics movement helped too.) Doctors who were not interested in making abortion illegal were threatened with these laws, and forced into compliance, as they would be the ones prosecuted if they ignored them. In hindsight, the mainstream medical community played the role the conservative religious leaders of today do, making themselves the moral deciders of society. In a dig through the New York Times archives, newspaper headlines from the mid 1800s to early 1900s reflected as much. But eventually, that position of authority would punish the doctors themselves, as the laws their predecessors had helped develop got them arrested when they tried to do their job and help save lives. She was poor. Just before her death she said she was not able to support her family during her confinement. This appeared to be a reason for her wretched act. There was a warrant out for the arrest of the doctor in that case, and hundreds of similar cases were reported as the decades went on, all described in the same way papers would discuss burglaries or murders—doctors convicted of manslaughter for performing abortions, women who were “seduced” who ultimately died from abortions gone wrong (“She was 23 years old and very pretty”). In many of them, the doctors come off as the villains, the women as people who got what was coming to them. In the 1870s, new articles popped up, this time on legislation being passed to prevent “abortionists” from working, like making it illegal to advertise abortion services. Similar small articles on doctors and women being arrested continued, but by the turn of the century, there was an increase in pieces on discussions around birth control in other countries, likely because of a valid fear of the world’s growing population. As Reagan outlines in her book, it’s the 1930s when the more obvious shift to a movement to re-legalize abortion took place. Part of this was due to the work of Margaret Sanger, the founder of Planned Parenthood, who had been arguing forcefully since the 1910s that a greater use of birth control would (duh) decrease the abortion rate, an argument the group would continue to make as the decades passed. Articles about doctors being arrested for participating or starting “abortion rings” and “plots” continued into the 1950s, however. There’s something to be said for the space these were getting in the papers—articles that once spoke of abortion as an everyday (if illegal) occurrence, noteworthy only for its sensational nature, began to gain nuance (which can also likely be attributed to paper’s like the Times shifting away from a more tabloid-y style). According to Reagan, it was at this point that the early glimmers of the pro-choice movement slowly started to gain momentum. In the mid-1950s a small group of physicians and public-health workers initiated the earliest efforts to reform the abortion laws. The hospital system itself, which prevented doctors from providing abortions to patients and forced them to care for the damages to resulting from illegal abortions, generated physicians’ demands for legal change. Medical reformers soon linked up with leaders in the legal profession, and this professional alliance advocated reform of abortion law. Articles on religious groups from Unitarians to Catholics that had shifted their official stance on abortion became more frequent as well. Around this time, you start to see articles indicating that members of the government had been convinced to think it was time. Nations around the world were beginning to provide birth control services for “needy” families, and leaders and state legislatures like New York were pushing through legislation that would disable bans like the Comstock Law. The more liberal papers that these articles appeared in started vocalizing their dissent as well. Op-eds popped up regularly in the Times, and coverage of the dangers of abortion grew, turning into extensive articles that outlined how expensive and often life-threatening it was for women (particularly poor women) to try to end their pregnancies. The entertainment industry responded as well. On television, censorship had become more lax, “illustrating a growing permissiveness of the medium,” reflecting “a more liberal society,” a change was generally happening across all of Hollywood. While there was pushback against those who wanted to discuss abortion frankly, networks were suggesting that abortion should be legal as early as 1962, like on an episode of The Defenders called “The Benefactor”, which the show’s regular advertisers boycotted. The Program, admirably narrated by Walter Cronkite under the title of “Abortion and the Law,” did not quite come out in favor of changing the abortion laws, but in effect did take the next closest step. Unsurprisingly, the general public was pro-legalizing abortion, and more vocal about it too. A 1966 poll found that most Americans favored legalizing abortion, including Roman Catholics. Women who wanted to get abortions were less afraid, and more vocal about it, suing states where they had been denied access, paving the way for Roe v. Wade. Women felt safe enough to speak on the record about educating others on how to perform safe legal abortions, though they could end up being described as a “38-year-old spinster” with “the eyes of a zealot,” as Patricia Theresa Maginnis of San Francisco was when she was discovered leading “abortion classes” (Maginnis herself had reportedly been pregnant three times and given herself two of her three abortions). By the late 1960s, the push had worked: abortion was starting to be legalized in some states, like Ohio, Colorado and New Jersey. As was the case when marijuana or gay marriage was legalized in certain states, doctors in states where abortion had become legal were flooded with calls from women desperate to have safe, legal abortions, and willing to travel to get them. The shift was mirrored around the world as well. You know what happened next: Roe v. Wade made it to the Supreme Court. But what you can see from the headlines right before it was decided is a country that had gone from not considering women’s rights frequently at all to finding themselves inundated with the issue. The shift had been spurred by doctors and law advocates, but the people truly responsible for mass media coverage were women’s rights activists, who, as Reagan explains, “retheorized the meaning of abortion.” Where bylines on articles about abortion and others women’s issues were once written by men, women were writing the articles they wanted to see—and big ones at that. Michigan’s only woman state Senator stood brushing tears from her face today while her male colleagues applauded after she told of her own abortion in a dramatic but futile attempt to win passage of legislation liberalizing the state’s 100-year-old abortion statute. She may have been one of the first on record to speak out in such a way—consciousness-raising circles that served as safe spaces for women to discuss their troubles had only just started to gain traction—but we know what happened next. Beebe’s actions have been mirrored by the actions of the many women who would follow her, those demanding to be heard by their colleagues, as Wendy Davis did in 2013 when she filibustered a Texas abortion law, or speaking to the people who should be listening to them, as Sandra Fluke did in 2012 when she attempted to testify in front of panel of all men at a Congressional committee on insurance and birth control. Or the thousands of non-famous women (and men) who have protested the abortion laws put in place in the forty-plus years since Roe v. Wade was decided on this day in 1973. This war—as is true of most skirmishes—has had many battles, the opposition led by almost as many generals. One side, however, has always had one thing in common: Women. 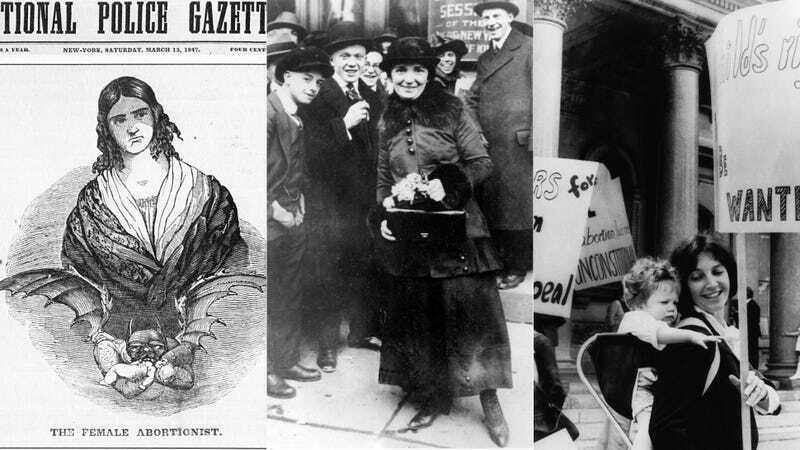 Top images, from left to right: abortionist Madame Restell, Wikimedia Commons; Margaret Sanger, AP; a woman protests in New Jersey in 1969, AP.